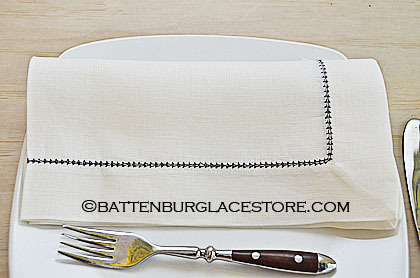 Linen Napkins with color "Hemstitch Trims"
Natural linen color (Winter White), black color hemstitch. 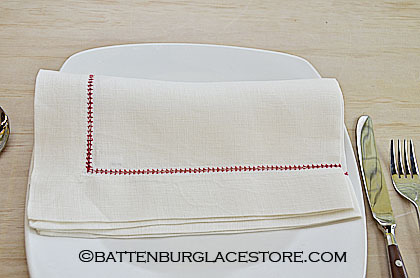 Natural Linen color (Winter White), red color hemstitch. 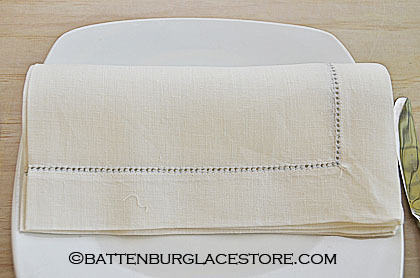 Natural Linen color (Winter White), Gray color hemstitch. Dinner Napkin. 20"x20" All Linen Fabrics. Natural color fabric (cream) with Black color hems. Natural color fabric (cream) with Gray color hems. Natural color fabric (cream) with Navy Blue color hems. Natural color fabric (cream) with Red color hems.